Saturday was, in case you had forgotten, the one-year anniversary of Buster the Wonder Dog’s frolic at the Sowden House in a search for evidence to link Dr. George “Evil Genius” Hodel to the Black Dahlia killing. You may recall that Buster “alerted” at several locations and that soil samples were taken for testing for possible human decomposition. The supermarket media and reporters who specialize in one-source stories have had their fun with “Ex-Homicide Cop Says Evil Dad Killed the Black Dahlia ” and moved on to whatever will pump up TV ratings or is trending on Google, “Victoria’s Secret Fashion Show” being today’s likely topic. 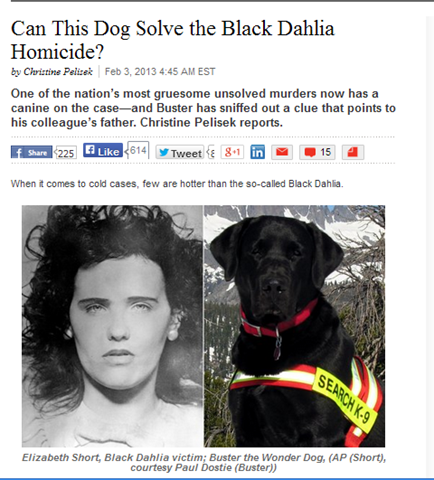 Feb. 3: “Can This Dog Solve the Black Dahlia Homicide?” by Christine Pelisek in the Daily Beast. The Nov. 9 search of the historic Sowden House on Franklin Avenue in Hollywood was set up in conjunction with the TV show “Ghost Hunters.” Although it was filmed, the segment with Buster never aired. Back at the Hodel house last November, Buster was turned loose to search for scents related to human decomposition—and he perked up, or “alerted” as Dostie calls it, at several potential clues in the basement. Soil samples were taken and results are expected next week. We waited. Next week came and went. And the week after that. In other words, the producers of “Ghost Hunters” took Hodel, Dostie and Buster to the Sowden house, filmed Buster engaging in activity that they described as “alerting” to human decomposition and didn’t use it in the show. Then the tape was aired on KNBC-TV Channel 4, on Feb. 1, kicking off sweeps month, when TV stations go into hyperdrive, broadcasting their most lurid, sensational stories in an attempt to boost their Nielsen ratings. Executive summary: Buster the Wonder Dog’s frolic in looking for Black Dahlia “evidence” at the Sowden House was all about KNBC trying to boost its ratings for sweeps month. It was a nothing story, which is why “Ghost Hunters” didn’t use it. And now we have proof. Another good story ruined by the L.A. Daily Mirror. This entry was posted in 1947, Black Dahlia, Hollywood, LAPD, Television and tagged 1947, black dahlia, George Hodel, lapd, Television. Bookmark the permalink. Are you saying I’ve missed another Victoria’s Secret Fashion Show?? Here’s a great idea. It seems to me there is a substantial and persistent reservoir of interest in the death of Elizabeth Short. Why shouldn’t some young guy with a nose for facts, reasonable writing skills and maybe a background in journalism, bring it all together in one nicely laid out, reasonably priced volume? You know, just the factual stuff, presented with a droll wit, perhaps juxtapose some of the more egregious misrepresentations and close with some best guesses or an explanation why there are no best guesses. I’d buy it. In a heartbeat. Hell, KNBC’d probably kick off sweeps week with it. Now if I can just get somebody to show me how to get on Victoria’s Secrets mailing list.